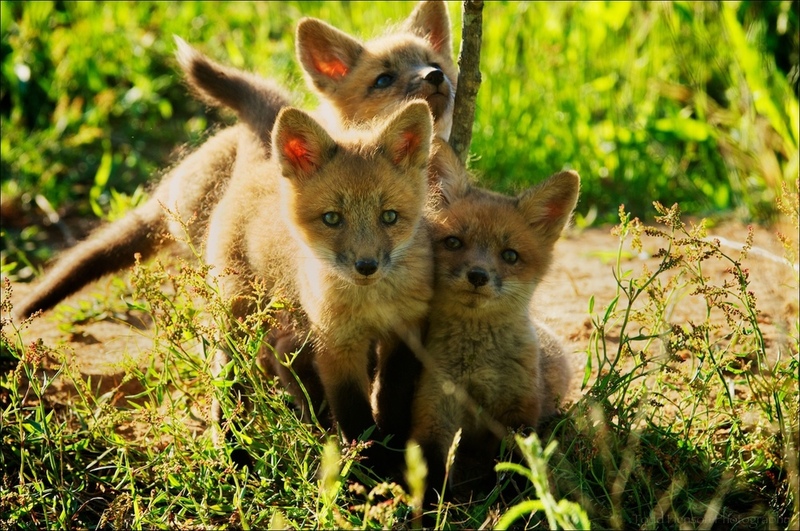 Red fox are a small to medium size canine with reddish brown fur (though it can take on other colorations such as silver or black). It often has black on its legs and tail and a white tip to the tail. 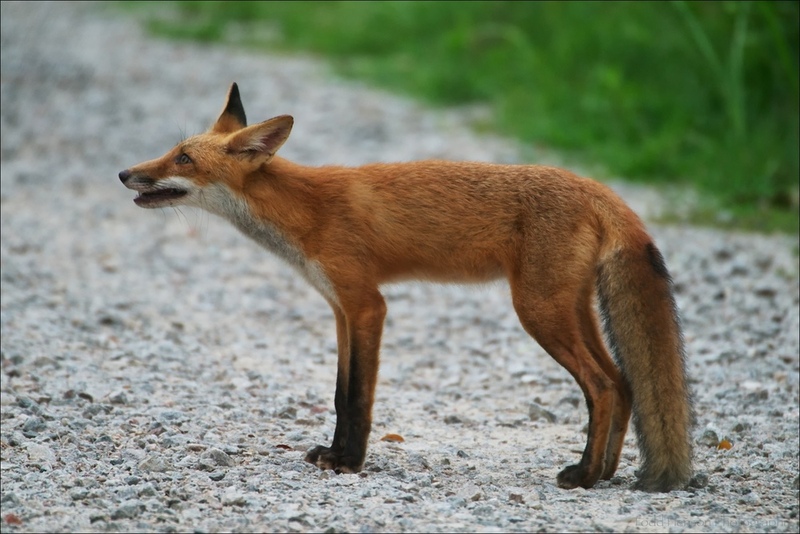 Red fox, as with coyote, are common throughout most of North America, though they are not often seen. They typically move around at night, though they can be seen during the day. 2013 was a good year for photographing red fox. A pair established a den just off a wildlife refuge trail and had at least 8 pups. Being born so close to the trail and being as many young animals are, the kit were not overly afraid of people. The adults, though, were rarely seen. The kit would typically wake and leave the den in the late afternoon, perhaps around 6 pm. Unfortunately, the sun would set directly behind the den, so on cloudless afternoons the light could be very harsh creating strong backlight. I visited them one morning when the light was fantastic, nice and soft, making for great photographs. The kit did tend to be a bit more lethargic than in the evenings. My morning was their evening, and vice versa. Unfortunately, news of the den had spread. People who rarely, if ever, visited the refuge were turning up in large numbers, and some were not at all sensitive to the well being of the fox, seeing them as nothing more than a subject to photograph. They would rush back and forth on the trail, making noise, following a fox trying to get the best shot, while disturbing and often scaring some of the kit back into the den. Shortly after this the refuge staff closed off that trail until the fox had left the den. It was unfortunate, but for the best. I continued to see some of the maturing red fox throughout the rest of the year. They became more leery of people making them more difficult to photograph. But in one instance I had a fantastic experience. My brother and I were walking the trails photographing. We'd stopped on a bridge that separates two sections of wetlands. A red fox came trotting up the trail directly towards us. It didn't slow down or stop until it was perhaps 10-15 feet away. It stopped and watched us, then sat down and tried to ignore us. It scratched itself, watched birds fly by in the sky, and generally behaved as if we weren't even there, perhaps hoping we'd just disappear. We slowly moved as close to the side of the bridge as we could to give the fox room on the other side of the bridge if it wanted to cross. We waited, taking shots every so often. 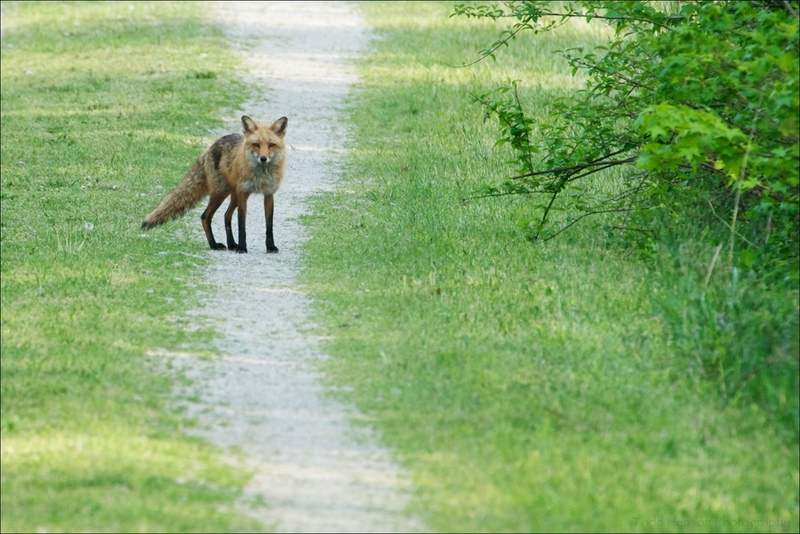 Eventually, the fox got used to us enough to get back up and cross the bridge, coming within about 6 feet of us. It picked up its pace when it was parallel to us, then slowed back down after passing us. It stopped, turned around and looked at us for a short while, then continued on its way. Fantastic experience.